Through the power of the internet we are occasionally given great gifts, be they Twitter corruptions of Presidents and their waifus or manga versions of Minor League baseball. Often, these gifts come in the form of cats. Beautiful, devious, sneaky, fluffy, adorable, or evil — we can always count on there being fresh feline entertainment on the daily. 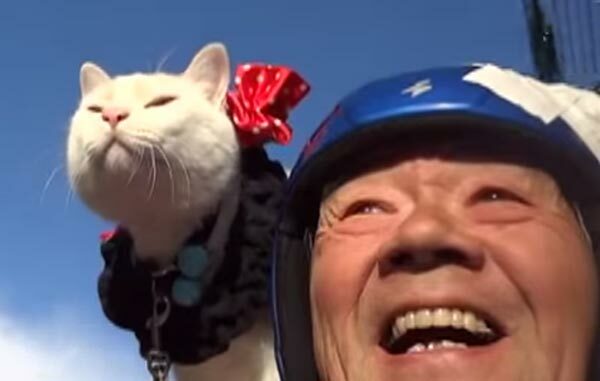 In October of 2013 (but mostly undiscovered until today), YouTuber nana bun from Japan documented a wonderful adventure: a day trip with him and kitty cat, Ryunosuke. It begins with a ride on the motorcycle — Ryunosuke perches on his owner’s shoulder like a little fluffy parrot. In exchange, nana bun is given a kneading massage on his weary legs. The cat and the old man seem to share a mutually beneficial existence, and take care of one another’s well-being. Is there anything more cute than a happy old man and his best friend? The duo smile together throughout the super cute video while they ride oh-so-jollilly to the park. Today is Ryunosuke’s lucky day, because he gets the swing set all to himself! After a full day of play, the pair ride back home, fondness in their hearts. Exhausted from the afternoon’s events Ryunosuke stretches in front of the warm sun before treating the camera to one more adorable pose. nana bun hasn’t uploaded any content since “ネコ ねこ 肩乗り ドライブ 猫 の 1日 ショートムービー Cat and Jump on shoulder,” so we can only assume that the companions are still riding healthily and happily to this day.